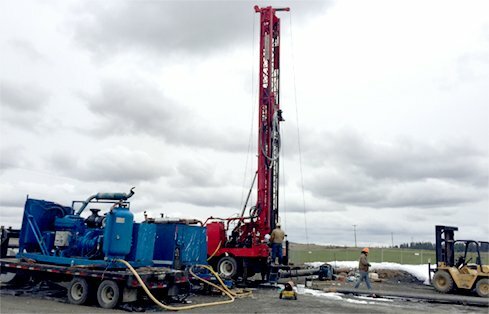 GeoEngineers' experience with the local aquifer system allowed the team to target a deeper portion of the Columbia River Basalt Group not used by existing wells. The telescoping permanent casing assembly initiated at a diameter of 20-inches, with a 12-inch-diameter liner assembly installed between depths of 373 and 550 feet. GeoEngineers worked with DSHS’ drilling contractor to construct the new 550-foot well. The completed well cap after construction. Careful planning improves groundwater production without interfering with existing wells. Eastern State Hospital is a 287-bed inpatient psychiatric hospital in Medical Lake, Washington, and one of just two state-owned adult psychiatric hospitals. This important medical facility relies on groundwater from two off-site production wells which pump water to the facility from a basalt aquifer system. Water levels in both wells were declining, and one of the wells was compromised by wellbore instability (caving walls). 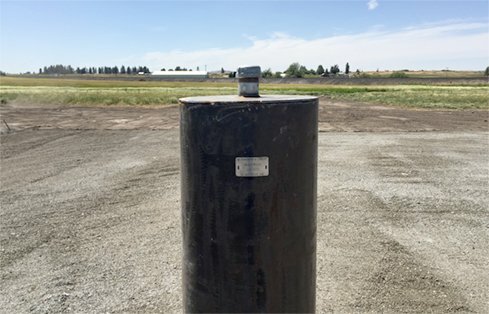 The Washington State Department of Social and Health Services (DSHS), which operates Eastern State Hospital, contracted with GeoEngineers to replace the compromised well and improve the sustainability of their water supply. 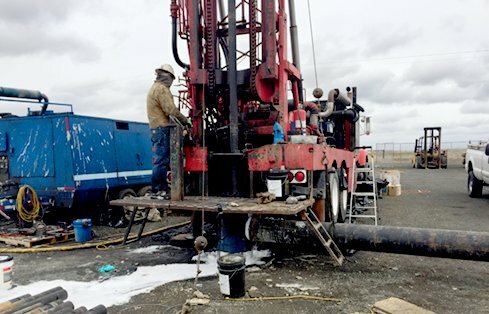 GeoEngineers’ hydrogeologic professionals have many years of experience developing groundwater supply within the local aquifer system and used their knowledge to design a well-drilling program that targeted a deeper portion of the Columbia River Basalt Group than existing wells. 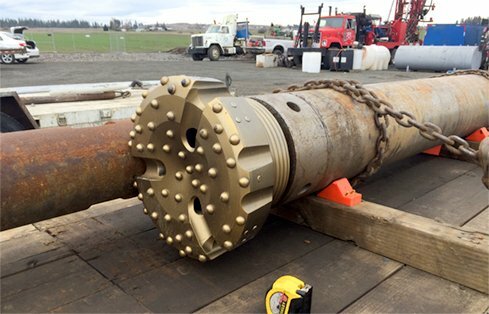 GeoEngineers began by coordinating with DSHS and the Washington State Department of Ecology to make sure that the replacement well would be seamlessly incorporated into DSHS’ existing water rights portfolio. Prior to drilling a new well, GeoEngineers assisted DSHS with contractor selection by developing detailed technical specifications (and an associated construction cost estimate) that protected the hospital’s interests during execution of this complex project. GeoEngineers worked with DSHS’ drilling contractor to construct the new well. The well construction was complex, extending to a depth of 550 feet below ground surface, per project specifications. To keep the new well from interfering with existing wells, GeoEngineers’ design included a 380-foot formation seal. This sealed off the overlying Wanapum Basalt Formation and the portion of the underlying Grande Ronde Basalt Formation from which DSHS’ wells were already drawing water. The telescoping permanent casing assembly initiates at a diameter of 20-inches, with a 12-inch-diameter liner assembly installed between depths of 373 and 550 feet. We tested the new well at rates up to 1,150 gpm. The finished replacement well doubled the production of the original unstable well. The new well is sufficient to act as the Eastern State Hospital’s primary groundwater source and does not interfere with any other existing wells.